TRANSFORMING HEALTH – The Wolf administration says the $5 million program to distribute the overdose reversal drug naloxone includes providing it to emergency medical service personnel, who are often the first on-scene to an overdose. However, some EMS companies say that statement is misleading, because Department of Health policy prohibits their paramedics from using the type of naloxone the state is offering them. EMS companies say that detail matters because the public should know that emergency services are not necessarily getting state support at a time when they are being crushed by the financial costs of opioid addiction. EMS agencies are required to carry naloxone, which has increased from $19 a dose in 2012 to $41 a dose in November, said Susquehanna Township EMS director Matt Baily. 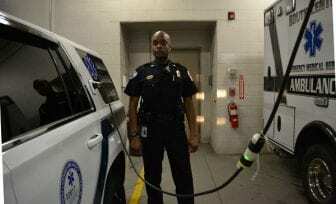 Spending money on naloxone is one more financial strain that means, in some cases, EMS companies can’t afford new vehicles, equipment or additional personnel. The Wolf administration’s effort has put naloxone in the hands of police, firefighters, and anyone who wants it, as part of an effort to fight the opioid epidemic. “The money that’s covering this distribution of naloxone, as well as the naloxone that we would distribute to first responders such as police and EMS, is coming from the legislature…” Department of Health Secretary Dr. Rachel Levine recently said on WITF’s Smart Talk. However, the health department’s own policy states paramedics should give the patient a much lower dose of naloxone than what the state is providing, Baily said. Specifically: Department of Health’s protocol is .4 milligrams of intravenous naloxone or 2 milligrams of intra-nasal or intra-muscular naloxone. The naloxone the state has purchased is a 4 milligram nasal spray, which Baily said falls outside those rules. Naloxone nasal spray is also not what paramedics would want at a time when every second counts, said Jason Campbell, Chief and CEO of South Central EMS in Dauphin County. Paramedics can control the dose of intravenous naloxone, helping a person to breathe on their own without necessarily waking them up inside the close quarters of an ambulance, he said. Intravenous naloxone also works more quickly and reliably than nasal spray. Medical reasons aside, Campbell said the main reason his paramedics aren’t using the state-issued naloxone is because of the state policy. At the Department of Health’s Bureau of Emergency Services, director Dylan Ferguson said paramedics are correct to follow that rule. “Ultimately, as a paramedic, I would follow my standing medical orders, and my standing orders are clear that for an advanced level provider, I am to start by using the available intravenous option,” Ferguson said. Not all EMS companies are doing that. At Lancaster EMS, director Jerry Schramm said the state’s naloxone has been a welcome help — especially at a time when EMS services are losing money to the opioid crisis. He said both his EMTs and paramedics use the nasal spray. Still, in approximately 35 percent of overdose calls, Lancaster EMS paramedics administer intravenous naloxone, he said. That’s often after state-purchased nasal naloxone has already been administered. At Susquehanna Township, Baily noted that most EMS companies in Pennsylvania are small nonprofits that receive little or no taxpayer help. Naloxone is just one of the costs the companies incur each time they drive out to a scene, Baily said. Every time an ambulance leaves the station, it can cost $500 or more in personnel and resources. At South Central EMS, Campbell said that within the larger scope of the opioid crisis, EMS companies paying for their own naloxone may seem like a small matter. Still, they’ll use any help they can get — and they need help.